Seeking a fresh approach to its core brands, Georgia-Pacific has hired four new agencies after an unconventional review. Joining G-P's creative roster are Droga5, which will handle Quilted Northern and Dixie; Deutsch LA, for Angel Soft and Vanity Fair; The Martin Agency, for Sparkle; and Cutwater, for Brawny. Previously, those brands, which collectively spend nearly $90 million in media annually, were handled by DDB and Eric Mower + Associates. The shifts leave those shops without any assignments. 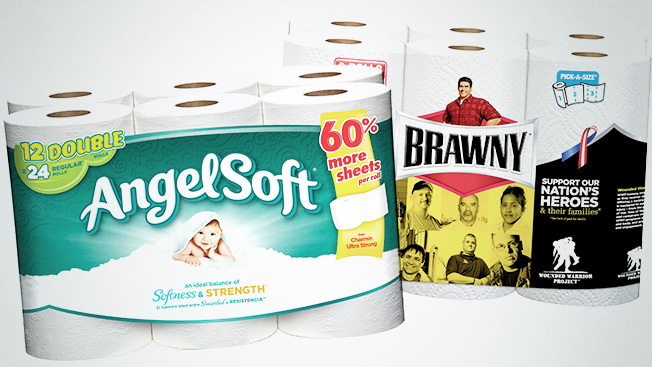 The top spenders in media are bath tissue brands Quilted Northern and Angel Soft, which each spent about $25 million last year, according to Kantar Media. Dixie's spending exceeded $22 million, Sparkle's approached $9 million, Brawny's topped $6 million, and Vanity Fair's was less than $1 million. The new agencies were chosen based on their previous experience and discussions with G-P chief marketing officer Douwe Bergsma, according to a company representative. And while the agencies explained how they worked, they didn't pitch creative concepts. So, in that sense, it was an unconventional process. Madam, a consultancy led by Michael Lee, helped manage the search. The new agencies have "proven track records for creative that breaks through" and "delivers positive results," Bergsma said, in a statement. The first ads from the newcomers are expected next year.